A sandbox for the offspring made of oak. It was a good reason to utilize some of the cracked heavy wooden beams. 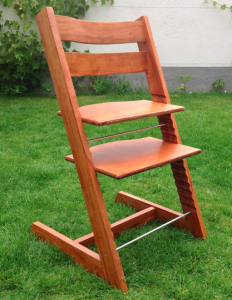 After having created the template for the router and the backrest the decision was made to build a second version of the highchair. Probably the raw material is pear wood; we do not know exactly. The seat and footrest are made of birch multiplex and stained. 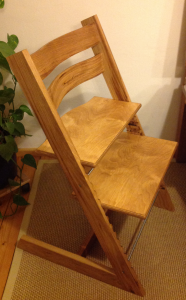 Using some oak offcuts from the last project there was enough wood to build a replica of a well known highchair. The seat and footrest are made of birch multiplex. 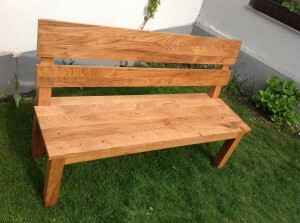 Solid oak (Quercus robur L.) garden bench.